Since you basically get two games in one, not to mention one of the best video game soundtracks you're ever likely to hear, you can't beat Shining Force CD for value. The game has everything a Strategy RPG fan could possibly want and more. It may be argued that the Sega CD just didn't have enough great games to warrant a purchase back when it was new, but Shining Force CD is one shining example that there may not be a lot of great games, but the ones that are great are absolutely outstanding. A must own Sega CD title. Pour ce qui est de la nouveauté, il va donc falloir passer son chemin, car c'est du Shining Force pur et simple. Il s'agit donc d'une espèce de "data disk" pour les fans absolus de ce genre de jeu, qui est finalement toujours aussi fabuleux. Un achat indispensable pour les fans, car pour une fois c'est TOTALEMENT jouable malgré le japonais. Aufgrund des hohen Anschaffungspreises von "Shining Force CD" stellt sich die Frage, ob sich der Kauf lohnt. Ich sage definitiv ja! Mit gleich zwei Abenteuern bietet die CD stundenlangen Spielspaß mit rundherum perfektem Gameplay und exzellentem Soundtrack. Zusammen mit den Extras bietet das Spiel mehr als 50 Kämpfe. Man sollte sich nur bewusst sein, dass es sich um eine Game Gear-Portierung handelt, die weit hinter den Möglichkeiten des Mega CD liegt. If you have never played a strategy RPG before, this series is the perfect place to start. The SF games certainly have more depth and difficulty than other "beginner" games like Rhapsody, but with a smaller learning curve than much of the competition. The beauty of the series is that it manages to be easy to pick up and get into without treating you like an idiot. The result is, at the risk of sounding like a clich?, a great game for both beginners and veterans alike. None of the four parts are particularly long, the last two being particularly short, but taken as a whole Shining Force CD is an excellent package well worthy of carrying the Sonic Team and Saga logos. More linear than the previous Shining Force titles, but tonnes of RPG action for your money. Insgesamt lässt sich sagen, dass Shining Force CD von der Epik und der Komplexität nicht an die Serienableger für Heimkonsolen heran kommt. Auch das völlige Fehlen von Stadterkundungen ist dem RPG-Spektakel anzukreiden. Davon aber abgesehen, haben die Entwickler alles richtig gemacht. Der Umfang ist enorm (für das Beenden aller 3 Storys sollten mindestens 50 Std. eingeplant werden) und das Spielprinzip motivierend wie eh und je. Serienfans und RPG-Fanatiker sollten unbedingt zugreifen, sonst verpassen sie womöglich eines der besten, wenn nicht sogar das beste Strategierollenspiel der kurzen Mega CD Ära! No deja de ser muy adictivo, atrapando en épicos combates donde la estrategia se convierte en fundamental, pero ha perdido la quizá más adictiva posibilidad de perderse en enormes mapeados y atascarse frente una situación difícil. Die Kämpfe sind spannend und hochmotivierend, die klassische Musik absolut hörenswert Leider wurde jedoch auf den üblichen RPG-Teil komplett verzichtet. Ein Shining Force-Spiel mit zwei Gesichtern. Als erstes sei der große Spielumfang der Silberscheibe, der Vollblut-Strategen sicherlich über Wochen hinaus fesseln dürfte, lobend erwähnt. Auch die feierlich klingende, klassische Musikuntermalung in CD-Qualität tragt einiges zum Spielspaß bei. Auf der anderen Seite wirkt sich der komplette Verzicht auf Rollenspiel-Teile jedoch negativ auf Atmosphäre und Abwechslung aus. Der strikt vorgegebene Spielverlauf, der eigentlich nur aus purem Kämpfen besteht, läßt insgesamt Überraschungsmomente vermissen und könnte deshalb bei dem einen oder anderen Spieler auf Dauer Ermüdungserscheinungen hervorrufen. Wem jedoch das bewährte Strategie-Spielprinzip reicht, dürfte mit der CD-Version sehr glücklich werden, wobei von einer Systemausnutzung - es gibt noch nicht mal Zwischensequenzen in Zeichentrickqualität - keine Rede sein kann. Shining Force CD offers no real upgrades in graphics or sound from the original cart version, but it's worth buying just for the new story and the extra long plotline. Along with it's new items and weaponry, the 20 different spells mixed between three different spell casting classes and multiple difficulty levels insure that this is one game that's gonna take you a long time to grow tired of. A must own for fantasy fans. 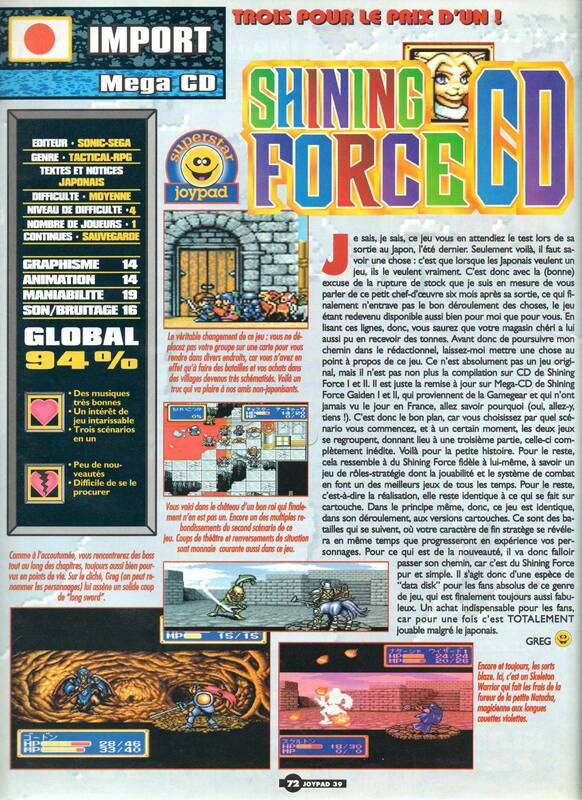 Malgré l'absence regrettable de villages et la durée de vie un poil courte, ce Shining Force CD est une valeur sure, qu'il ne faut absolument pas louper, les RPG de cette qualité étant une denrée rare sur le support. If there is one single, great tragedy with Shining Force CD, it's that so few people ever actually got around to playing it. At the time, the series was just getting on its feet, and the Sega CD itself was still struggling to obtain some decent sales, which it may or may not have ever gotten (depending on who you ask). This combination of sad factors led many to overlook one of the better strategy/RPGs out there. Let me echo the voices of those who stand behind this forgotten classic and sing the praises of everything Shining! Shining Force CD, while lacking dimension, has added more battles and a second adventure. If you are a big fan of the first two, the game is definitely worth a look; just don't expect the same depth of gameplay. Although Shining Force CD rates as an above-average game, old Shiners who are looking for something new won't find it here. If you're into simulations, though - and you have a lot of patience - you may want to shine your light this way.